Today I am joining a virtual cookie exchange with my friends at #SundaySupper. 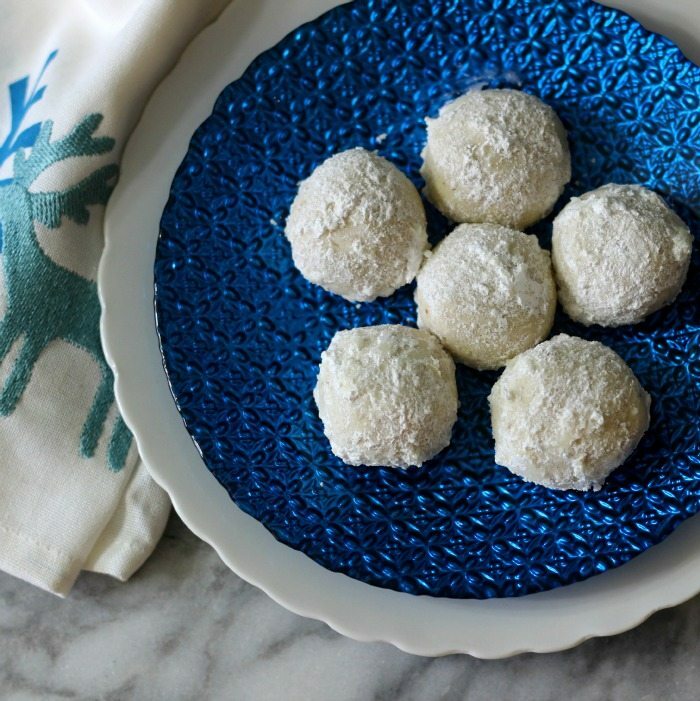 Today we want to share with you cookie recipes to help get you through the holiday season. Can you believe it’s almost Christmas? I don’t, it’s just pure craziness. But it’s here and that means cookie season is upon us. However, every week is cookie season in my house. You know how I love to bake my cookies every Sunday and now I have an excuse to bake even more. I can guarantee there will be lots of cookie recipes in the next month. 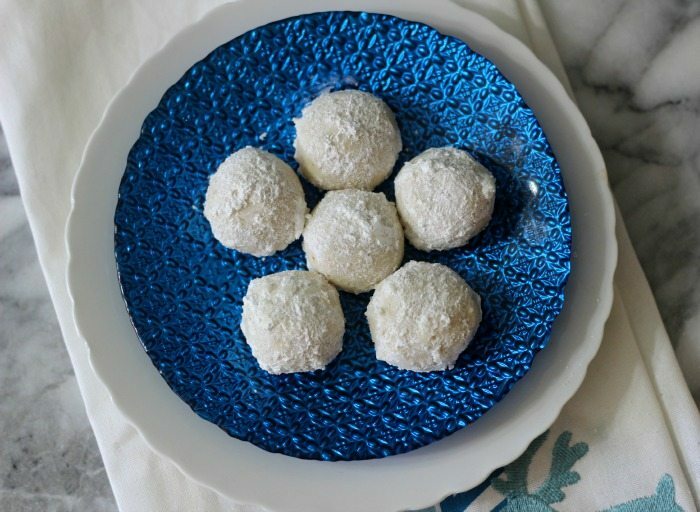 Today I am sharing with you Snowball Cookies, other known as Wedding Cookies. Yummy! These cookies are light, fluffy and have an amazing almond flavor. Plus they are super easy to make too. I loved them so much I made a double batch, one for home and one for work. They are also the perfect cookie to make if you are out of eggs. Yup, no eggs involved in these cookies. 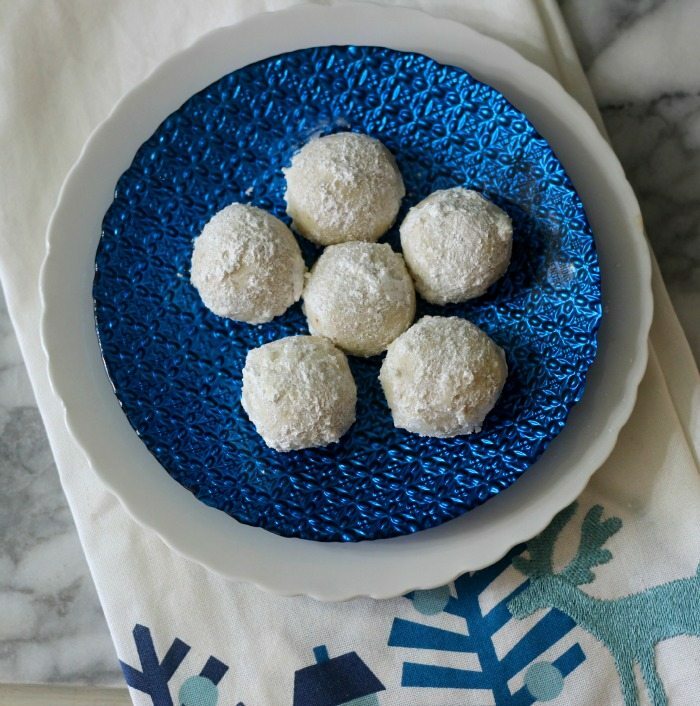 The Snowball Cookies are made with ground up almonds, flour, butter and almond and vanilla extract. I have to say the star of the show is the powdered sugar. You only need a half cup in the cookie and of course you need more for rolling the baked cookie in. These cookies kind of remind me of an elegant cookie I would get in Europe. In the recipe, I didn’t have ground up almonds, so I used whole almonds and just ground them in my mini food processor. Super easy to do. So don’t worry if you don’t have ground almonds on hand. By the way, buy your almonds in bulk if you can, so much cheaper buying them this way. 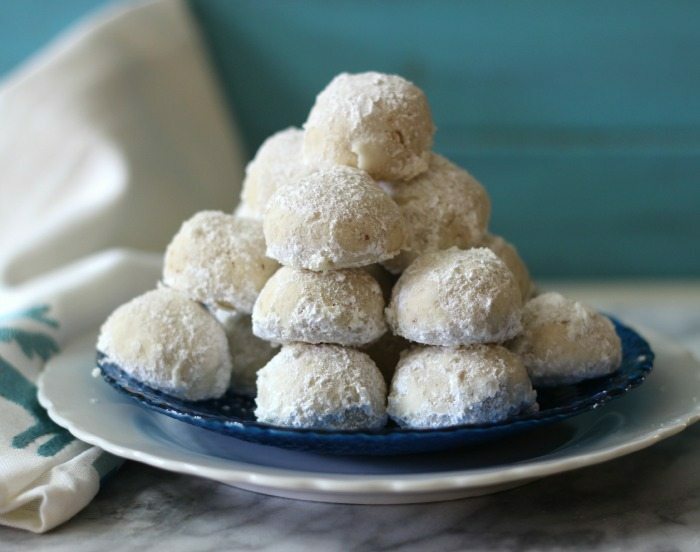 A puffy, round cookie with the flavor of almonds that have been rolled in powdered sugar. In a large bowl, add butter, sugar, vanilla and almond extracts and salt; beat until well combined. Beat in ground almonds until combined. Beat in all purpose flour until just combined. Take about a teaspoon size of batter and roll into a ball. Place 1" apart on prepared baking sheet. Bake for 15 minutes, just until bottom starts to lightly brown. Meanwhile; in a medium bowl, add 1½ cups of powdered sugar. Take cookies out of the oven and let cool for about a minute. Roll into powdered sugar and place onto cooling rack. 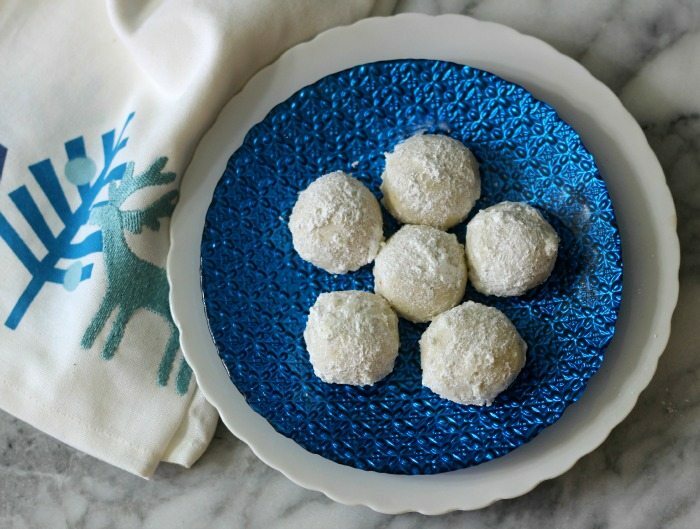 Once cookies completely cool, roll for a second time in powdered sugar. Place in a airtight container. You can use almond meal in place of ground almonds. To make ground almonds, just take ¾ cup of whole almonds and process in a mini food processor until ground. The calories should be less than what I posted. I had plenty of powdered sugar left over when I rolled them. I made two batches and still had left over powdered sugar. These cookies would be beautiful, displayed on your counter to share with guests. Plus the cookies are sturdy enough that they will ship well. You can store them in an airtight container on your counter. I don’t think they would freeze well because of the powdered sugar. I wanted to let you know that we are having a twitter party to discuss our favorite holiday memories, baking tips and more. It is scheduled for Tuesday, December 1st at 7:00pm (EST). Just use #Cookielicious. I would love it if you joined us! Now time to heat up the oven and bake your favorite holiday cookies. Chocolate – Pear Biscotti by What Smells So Good? Join us for a #Cookielicious chat at 7 p.m. ET Tuesday, Dec. 1, on Twitter We will be sharing tips for cooking baking along with stories about our favorite family recipes. Follow the #Cookielicious hashtag and remember to include it in your tweets to join in the chat. To get more great cookies recipes, check out our Cookie Jar Pinterest board. These are one of my favorite cookies! They are so dangerous to have around because I want to eat them ALL! These are some of my favorite holiday cookies! I’ve never made them with almonds, but I bet they’re amazing!!! I can remember making these as a child and with my own children. I guess being from the south, we always used pecans. It’s a wonderful recipe! Thanks for sharing your version!! 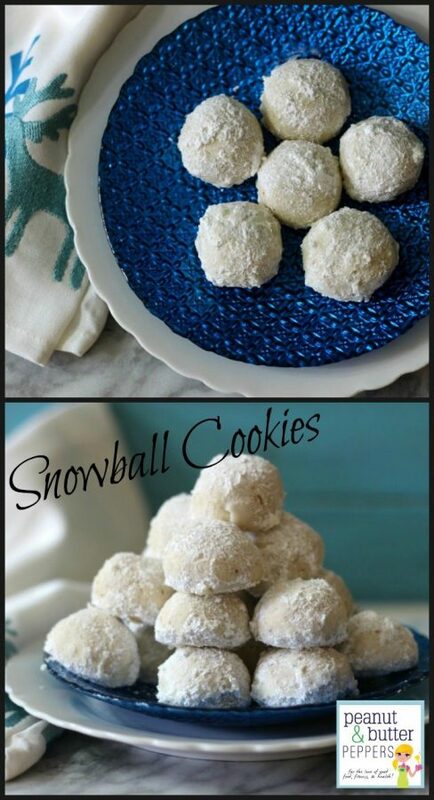 I make a version of snowball cookies almost every year. It is always well received!